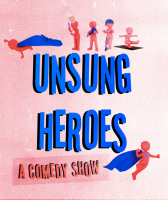 Get ready for ‘Unsung Heroes’ - join us as the BCC™ take a deeper look at the Unsung Heroes of Wider Rochester. A night to celebrate the overlooked voices of our society. We human-people focus too much on worshipping celebrities, the luminaries who quite frankly don’t do much. Eg. Paris Hilton (excluding her culturally groundbreaking work on ‘Paris Hilton’s My New BFF). We neglect the average Joe’s whose work goes unrecognised. ‘Unsung Heroes’ transforms ‘nonentities’ to ‘celebutantes’, all whilst making us laugh, giggle, and maybe even snort. Who knows? A celebration of these characters will redefine what we deem as important, paying homage to characters like wise Wendy from the Co-op Bakery, Brenda from the PSA or Susie from HR - what would we do without Susie? Head down to the Corpus Playroom for an absurd hour from Cambridge Comedy regulars and introducing new comedians, bringing to life a series of wacky, silly and endearing characters whose voices will finally be heard.